View a photo slideshow: By clicking Quick Look, you can view attached images in a full-screen slideshow. From on-screen controls, you can go back to the previous image, pause, advance to the next slide, and view an index of all pictures. You can also click to add pictures to your iPhoto library. When you’re finished with the slide show, press the Escape key on the keyboard to go back to the original e-mail. Flag messages: To call attention to messages you want to attend to later, place a little flag next to it. Choose Message→Mark→As Flagged (or press Shift+Command+L). 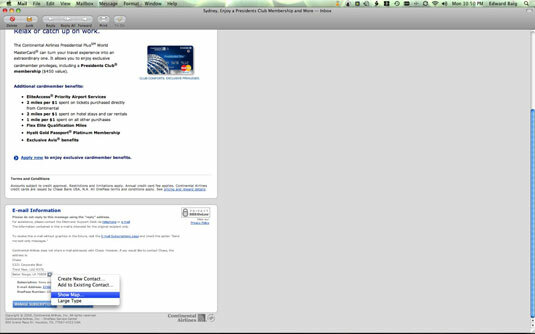 Synchronize e-mail: If you have a MobileMe account, you can synchronize all your rules, signatures, and other settings across all your OS X computers. Archiving mailboxes: Important mail needs special backup treatment, which is what archiving mailboxes is all about. First select the box or boxes you want to archive. Next, either choose Mailbox and then Archive Mailbox from the menu at the top of the screen, or click the tiny gear-like icon at the bottom of the Mail window and choose Archive Mailbox from the menu that pops up. Then choose the folder in which to hold your e-mail. Mail keeps archives in what it calls an .mbox package. To retrieve archived mail, choose File, choose Import Mailboxes, and then choose Mail for Mac OS X, and locate the .mbox file in question. RSS subscriptions: You can receive RSS feeds and blog posts directly in your inbox and be notified when something is new by choosing File and then Add RSS Feeds. Use parental controls: You can restrict who your child can correspond with through e-mail to only those addresses you’ve explicitly okayed. From the Apple menu, choose System Preferences, choose Accounts, and then click Mail & iChat. You’ll be notified when your child receives (or tries to send) messages to addresses not on your authorized list. Data detectors: Messages typically arrive with fragments of information you’d love to act on, such as an invitation to a dinner party or a trip itinerary. Mail in Leopard has data detectors, which can recognize appointments, addresses, phone numbers, and the like. So when you move your cursor inside the body of a message next to data the program can detect, a tiny arrow signifying a pop-up menu appears. Click the arrow next to an airline departure, for example, and you can add the event to iCal. Click next to an address, and Mail lets you create a new contact, add to an existing contact, or display a Google Map. Get rid of mail: You can dispose of mail in a number of ways. Highlight a message and press Delete on the keyboard. Drag the message to the Trash folder. Or click the Delete button on the toolbar. The messages aren’t permanently banished until you choose Mailbox→Erase Deleted Messages. Apple can automatically extinguish mail for good after one day, one week, or one month, or when you quit the Mail program. To set up automatic deletion, go to Mail Preferences, click Accounts, choose an account, and select Mailbox Behaviors.